Technology-Portfolio.Net - Currently a smartphone with four cameras is not a new thing anymore because Samsung has launched the Galaxy A9 with four cameras, even the Nokia 9 PureView has more cameras. But for Motorola, smartphones with three or four cameras are still new. Previously, it had appeared render the first three-camera smartphone from Motorola, which is thought to be the Motorola P40 Power or P40 Note. 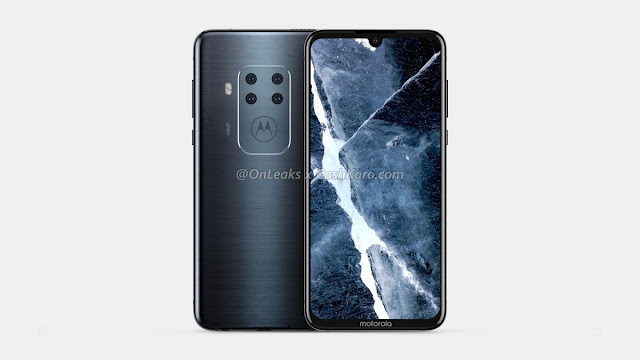 Now, Motorola smartphone rendering has appeared with four cameras behind. This time the leak came from OnLeaks which shared a rendering CAD from this unknown Motorola smartphone. This smartphone will carry a 6.2-inch wide screen equipped with a fingerprint scanner on the screen. While at the rear, we will see a four-camera setup that includes a 48MP sensor unit. This smartphone measures 158.7 x 75 x 8.8mm, which is not yet known whether the thickness includes the camera or not. Another thing that can be ascertained from this rendering is the power button and volume rocker on the right, the headphone jack and USB-C port on the bottom as well as the SIM card slot and the speaker at the top. You can also see a small hole in the back of the cellphone at the bottom, which is probably the third microphone. Unfortunately, other specifications such as batteries, processors and prices are still unknown.